MLB Commissioner Bud Selig finally announced the news Monday afternoon that everyone was waiting for. New York Yankees third baseman Alex Rodriguez will be suspended through the end of the 2014 season. However, in a slightly different twist that what was expected, A-Rod’s suspension does not officially start until Thursday, thus making the length of the suspension 211 games. It looks like Selig moved the start date to Thursday to force A-Rod’s hand on an appeal, as a player has three days to file an appeal once the suspension is announced. So, what’s next for A-Rod? Well, it is plainly obvious he is going to file an appeal on the ruling. MLBPA head Michael Weiner has already stated that Rodriguez has the full support of the union behind him. “We believe that the Commissioner has not acted appropriately under the Basic Agreement,” said Weiner in a statement. “Mr. Rodriguez knows that the Union, consistent with its history, will defend his rights vigorously. We must revisit the JDA’s confidentiality provisions and consider implementing stricter rules for any breach.” Once Rodriguez files his appeal, a hearing with an arbitrator must take place within 20 days. Then, the arbitrator has 25 days from the hearing to give his decision. It is possible that A-Rod can be eligible to play for the Yankees for as long as 45 days from today. It is more likely that they will have him for a month, give or take a few days. Once the arbitrator, Frederic Horowitz, makes his decision, A-Rod will then have to start serving his suspension immediately (unless, by miracle of miracles, Horowitz throws the suspension out completely. ) If Horowitz upholds the entire suspension length, then A-Rod will see that suspension last into the 2015 season. Today, Rodriguez is officially in the lineup for the Yankees for the first time this season. He is batting 4th tonight and playing third base against the Chicago White Sox. He is playing his first game of the season on the same day he was given the longest suspension ever handed down in MLB for performance enhancing drugs. On the day he was acknowledged as the biggest cheat in major league baseball history, he is going to go out and try to play his first MLB game since last year’s playoffs. Needless to say, it is going to be an absolute freakshow tonight! I have a hard time believing that A-Rod will be able to deal with the extremely negative crowd reactions he is going to get over the coming weeks (both home and away) as well as the intense media spotlight that will be following him. While he, unlike any other athlete perhaps in history, seems to adore and embrace drama, it just seems like what is sure to come will be too much, even for him. On top of that, all of this negative attention is going to be grating from the outset on his teammates, coaches and manager. Is he really going to go through with this? 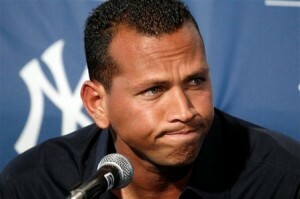 Long term, once the appeal is over and the arbitrator decides, A-Rod is going to have to sit-out a long time. Considering that MLB was ready to hand down a lifetime ban to A-Rod, as well as go through the courts by circumventing the Joint Drug Agreement (JDA), it seems highly unlikely that an arbitrator is going to reduce any of Rodriguez’s suspension. Apparently, Selig feels very confident that A-Rod is a repeat offender and tampered with the investigation, and that he could justify a lifetime ban under the ‘best interests of baseball’ clause. Therefore, by sticking to the JDA’s provisions and sending it before an arbitrator, Selig keeps A-Rod away from the court system. A-Rod will be out until sometime in 2015, once the appeal process is over. He’ll see how much he is hated by the MLB fanbase over the next few days. He is going to see vitriol unlike any we’ve ever seen directed at a player. I think, once he’s done playing in these games before the suspension is handed out, he is going to not want to deal with it again. The only reason he wants to play now and in the future is because he is owed a LOT of money by the Yankees. Basically, I foresee A-Rod looking to come to an agreement with the Yankees on the remaining years on his contract. Knowing he is already going to lose roughly $35 million over his suspension, he is still going to want to get some of that remaining $60 million that the Yankees will have to pay him through 2017. I just think he is going to approach New York, perhaps within the next few days, and request a portion of that remaining contract to walk away for good. Reports are out that he’d already tried to do this with the Yankees prior to the suspension being announced, so why wouldn’t he do this now that it is official? The Yankees and A-Rod are going to go through their divorce, one way or another. Reaching a settlement seems to be the best case scenario for all involved. New York was praying that Selig would go through with his lifetime ban and give them a $100 million windfall. That didn’t happen, but it looks like they will get out of paying A-Rod $35 million. If they can get out of paying him maybe another $30 million more, I think they’ll jump at that opportunity. Now they just have to wait for A-Rod to tire of the drama and do the right thing for both of them.